Kin Beach Provincial Park is located in the community of Comox, BC on Vancouver Island in the Comox Valley. The 9 hectare park is a waterfront beach destination with far reaching views over looking the Strait of Georgia. In the distance one can see the Sunshine Coast and the mainland mountains. The small park is tucked away under a grove of trees near the Comox Air Base. The park is a popular day use and camping destination, away from the community, equipped with picnic tables, fire pits and a small playground. The main activities enjoyed in the park include canoeing, swimming, fishing, camping, picnicking and beachcombing. There is no boat launch in the park. However there is a general store on site for replenishing supplies (hours of operation vary with seasons). 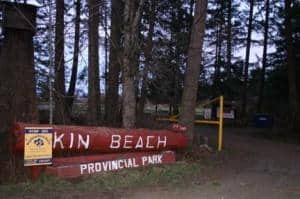 Kin Beach Provincial Park is identified as a Class "C" Park. A classification meaning it is a park maintained by a local community group and not by the provincial government. How to Get Here: Travel Highway #1 to the community of Courtenay, BC on Vancouver Island, BC, Canada. Travel the Inland Highway (Oceanside Route) towards the downtown core of Courtenay and cross the bridge. On the other side of the bridge turn right towards Comox Village and then turn onto Ryan Road. Take a left onto Little River Road near the Air Force Base and then right onto Kilmorley Road leading to the park.